We are counted among the trusted names engaged in manufacturing, supplying and exporting a quality-assured range of Urine Bag to our clients at leading prices in the market. Designed in accordance with the demands of the customers, these products are manufactured using supreme quality raw material, in tandem with highest quality standards. Our range of bags is widely appreciated by the clients for its high quality PVC sheeting, non-return valve and efficient functioning. 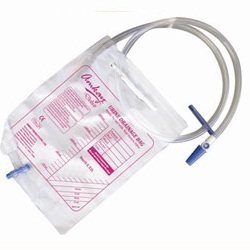 Our Urine Drainage Bags with capacity of 2000 ml with Non-Return Valve, kink resistance tubing & high quality P.V.C. Sheeting.